R10000-IP is rated 4.6 out of 5 by 18. Rated 5 out of 5 by RyanDe680 from Trusted name & easy install Full disclosure, my plumber did the installation, but I was there at the time. Plumbers prefer Delta and another brand name to anything when installing valves due to the repeated simplicity of installation and knowing the longevity and reliability of the brand. The valve took my plumber approx. 15-20 minutes to install, including bringing the copper to the valve. It arrived in perfect shape and was well protected in the box. Ask most plumbers, they prefer Delta products due to their quality and this valve has lived up to those expectations. Rated 5 out of 5 by KarlaN from Easy to Match I bought this valve and had it in my office in days. What I love the most about delta valves is how simple it is to match the valves with the trims since they have developed a universal valve that takes the guessing out of the equation. Not only that, but if you ever have to change the trim, for example, if you decide to redecorate and change the color of the trims, all trims fit most of the valves! Great buy! Rated 5 out of 5 by Laurajw from Easy installation We completed the bathroom renovation nearly a year ago. This valve was easy to install and we've had no problems with it at all. 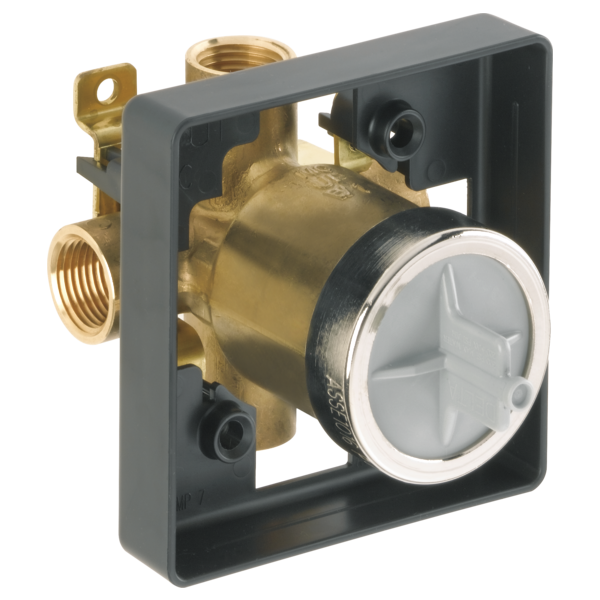 Rated 5 out of 5 by Brian from Love the flexibility As a builder I really appreciate the universal nature of this valve...It allows my clients the opportunity to select any trim in the delta catalog without the pressure of deciding early in the build process....thanks Delta! Rated 5 out of 5 by Chillian from Best deal This valve is the most reasonable priced out there and does its job as well as any high priced valve out there. Rated 5 out of 5 by dell 1416 from Delta R10000 Unibversal Installation was without incident and unit works as it should. Can you use the Lahara T17T238 stainless steel trim with a R10000 rough valve body? Does this valve come with the cartridge, trim plate and handle? Replaced the shower valve body with R10000-ip and cartridge with RP19804 cartridge - but the shower keeps going at full blast even when cartridge is at the full off position. Is there a version of the RP19804 which is white and grey ( instead of the normal white and blue) which should be used ? What shower cartridge can be used with the R10000-Ip valve body ? I have Delta T11851 Dryden 3 Setting Diverter, Chrome... Would it work with R10000-1P rough in valve? Thank you for your question. Delta Faucet model T11851 will need to be paired with Delta Faucet model # R11000 rough-in diverter valve. What are the dimensions of the R10000-IP model? The specifications diagram does not show this model with dimensions. Please explain. Am I missing something? Thank you.